Beaulieu Yarns, a supplier of high-quality synthetic polyamide and polypropylene yarns, now offers sustainable versions of all its polyamide (PA6) yarns for carpets for residential and commercial use, including automotive. 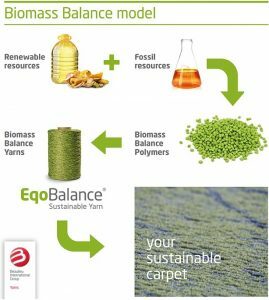 New EqoBalance PA6 yarns follow the biomass balance approach, which is designed to ensure that at the very start of the supply chain, natural renewable raw materials can partially or even completely replace fossil resources in the production of polymers processed into yarns. By choosing these yarns, carpet tufters can contribute to a sustainable future through less use of fossil resources and reduced greenhouse gas emissions. The sustainable yarns from Beaulieu Yarns conform to certification standard CMS 71 Certification of the use of renewable resources, which confirms the saving in fossil resources. The potential to reduce greenhouse gas emissions as a result of the replacement of fossil use is calculated in a Life Cycle Assessment (LCA). EqoBalance yarns hereby allow a reduction of up to 75% of CO2eq/kg compared to fossil based yarns, according to the manufacturer. “Carpet tufters are requesting more environmentally-compatible yarns to support their overall commitment to greater sustainability and more efficient resource use. We see biomass balance as the fastest path forward and, through EqoBalance, are excited to pioneer this milestone for the contract market as part of our long-term strategy to give customers a fundamental new choice to step into sustainable products and contribute to a better world,” commented Karena Cancilleri, Vice President of Engineered Products, Beaulieu International Group. The principle of biomass balance in production of yarns is comparable to that of green electricity. The basic idea involves using renewable resources such as biogas or bio-naphtha, together with fossil resources, in production of the polyamide. The share of biobased resources is then arithmetically assigned to certain products using a method certified by a technical control board. EqoBalance yarns do not compromise on either quality or performance, as their formulation remains identical to their fossil-based equivalents, the company explains. Since they are a drop-in alternative solution, tufters need to make no alterations to their manufacturing processes or final products. Beaulieu Yarns offers a wide variety of PA6 yarns for use in carpet tiles, carpet planks and broadloom carpets for commercial offices, hospitality and leisure, education and healthcare premises, automotive, and residential.